Grade Separation and the "Viaducts"
The first viaduct (overpass) was built, over the railroad reservation, in accordance with a franchise granted by the City in 1885 to the Elyton Land Company. 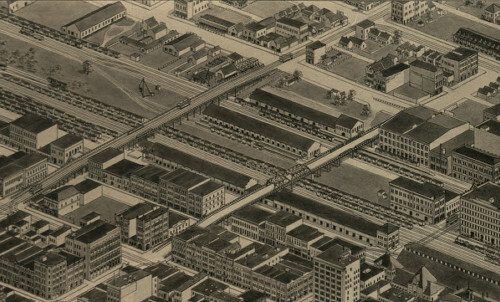 This viaduct was located at 22nd Street, was built 30 feet wide, made of wood and carried streetcar traffic. It would last for 40 years, until the City "forced" the Birmingham Electric Company to replace it in 1925. This was done by interpreting the old franchise agreement, in favor of the City. This view is looking north, and is taken from the Library of Congress (LOC) website. The next viaduct carried 21st Street over the railroad reservation, and was made of steel. It didn't carry streetcars, and was devoted to vehicular traffic. It was built prior to 1904, and lasted until it was judged to be obsolete. 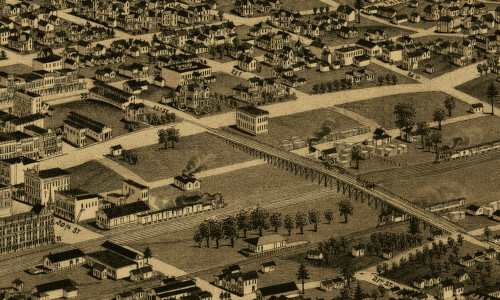 This image, also from the LOC, shows the 1885 22nd Street viaduct on the left, and the steel 21st Street viaduct on the right. The view is to the east. 20th Street is still at grade and would remain so for another 25 years. An early underpass, or subway, was built to carry 5th Avenue North and streetcar lines beneath terminal station. 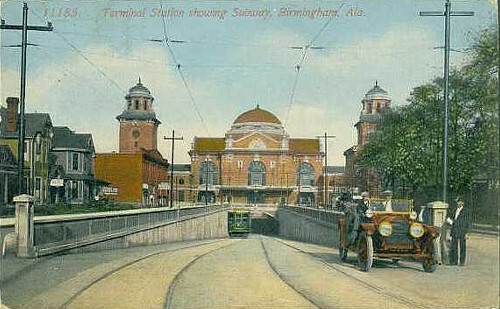 This opened with the Station in 1907. Sadly, the station is gone, but the tunnel is still there, without the streetcars of course. This is the site of the well known "Magic City" sign in later years.